I'd like to think that Jaleco's fate has been a little bit more tragic than any other company whose games have been covered by Lost Levels. Interesting historical footnotes that they may be, few of the games featured here would have drastically altered gaming history had they seen official release. California Raisins was just a speedbump on Capcom's road to becoming a major industry player. Nintendo is still going strong despite having never released Earthbound on the NES. The upcoming Final Fantasy XII is all but guaranteed a US release, even though a localization of Final Fantasy II was passed over by Square almost fifteen years ago. Unlike those companies, however, Jaleco is in pretty sad shape nowadays. 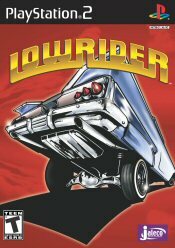 The once proud NES developer and publisher has now faded into an obscurity composed of halfassed rhythm games and lowrider simulators. Bashi Bazook: Morphoid Masher may not have single-handedly changed Jaleco's future for the better if it had been released, but the effort put into its translation represents a time when the company wanted very badly to be something more than it has become. Bashi Bazook is a good game. It's highly playable, engaging, and interesting enough in its own right. However, Bashi Bazook is also a very short and a fairly easy game. Had it been released, the game would only be remembered as yet another above average but unremarkable platformer in the NES's library. Sound familiar? Try replacing the game's title with "California Raisins," or "Secret Ties," or "Squashed," in that last paragraph and you'll begin to see why. The NES was so choked with platformers that several of them were denied release late in the system's life. Bashi is a little different, though. While the aforementioned titles were all scheduled for release in 1990 or 91, the Japanese version of Bashi Bazook was released in 1987 -- a pretty astounding fact considering the kind of quality found in Bashi's graphics, sound, and gameplay. The graphics are detailed and colorful, the music is varied and hummable, and the game itself has a nice exploration element to it that makes it similar in concept to classics like Nintendo's Metroid or Konami's The Goonies II. Don't let the exploration element fool you into thinking Bashi Bazook is anything but a pure action game, however. The game is divided up into side-scrolling levels in which the title character runs, jumps, and hacks up mutants against a strict time limit. In an interesting twist, the game's timer is represented by "Q.V." - Queen's Vitality - which counts up from zero at the start of a stage until the boss (or "Queen") is reached, where the time spent in the level serves as the boss's life meter. The player is faced with a choice: quickly race through each level so as to fight the Queen when she is weak, or spend the time to explore every facet of each stage to find all the weapons and power-ups throughout? The levels are laced with items and secrets to find. Entering the game's many doorways allows the player to buy or otherwise procure a number of weapons and accessories, as well as receive sometimes-helpful hints from the non-player characters within. 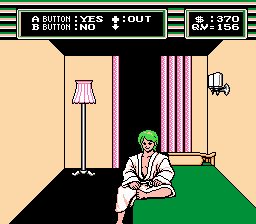 Bashi begins the game armed only with a knife, but soon enough discovers all manner of projectile-based weaponry as well, to even the odds in what is overall a solid, well designed action title. With all the good features that Bashi had going for it, one has to wonder why the game was never released. There are a number of potential explanations. 1989 was an unusual year for Jaleco, to say the least. While 1988, 1990, and 1991 each saw roughly a half dozen NES releases from the company, 1989 was host to a grand total of two new Jaleco-published games in America: Hoops and Goal!. Even Bases Loaded II, which sports a 1989 copyright date on the title screen, appears to have actually been released in 1990. Jaleco's '89 lineup was weak enough to begin with; aside from Bashi Bazook and the pair of sports titles, the company's only other planned title for US distribution was a port of the primitive 1985 Famicom shooter Exerion, which also went unreleased. Thanks to a lineup of popular sports titles like Bases Loaded and Racket Attack, Jaleco's first year as a publisher of NES games in 1988 was a resounding success. Why Jaleco wouldn't want to immediately follow up on this success is a mystery. 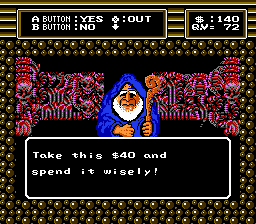 Perhaps the company wanted to take a more reserved approach to publishing games in 1989 to better evaluate their financial situation, or maybe there were concerns that their titles would be lost in the shuffle of the 110 new NES releases that year. Even for a game developed in 1987, though, Bashi still would've held its own among games released more than two years later. Bashi would have even fit in nicely with other similar games released another year later in 1990, such as Vic Tokai's Clash at Demonhead and Hudson's Xexyz. In fact, Bashi's uncanny similarity to Xexyz may have contributed to its eventual cancellation. While Xexyz was released a full year after Bashi in Japan, both games were scheduled to be released in 1989 in the US. Unfortunately, as good a game as Bashi may be, Xexyz simply outclasses it in just about every way. An underrated gem of a game, Xexyz does almost the exact same sidescrolling/door entering/item collecting schtick Bashi does, with the added bonuses of tighter control, faster gameplay, and the occasional shooter segment. Barring the intervention of a popular movie license or some creative packaging, it's unlikely that gamers would've chosen Bashi over Xexyz if both games were available to them at the same time. Whatever the reason for Bashi's cancellation, the game's US localization was fully completed before the project was shelved. Complete copies were sent out for review, and both Game Players and Video Games & Computer Entertainment, among other publications, covered the game. 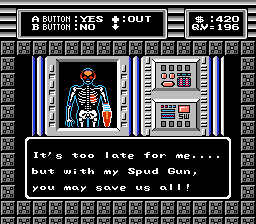 The existing prototype image is completely translated and fully playable in English from beginning to end. Prior to the prototype's availability, however, a fan translation of the Japanese version of Bashi -- entitled Bio Senshi Dan: Inkliezar to no Tatakai -- was created and distributed in 2003 by Abstract Crouton Productions. 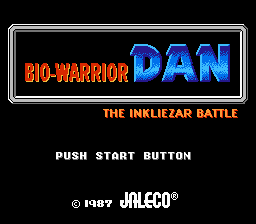 Comparing the translated Dan to the prototype of Bashi Bazook offers a unique insight into how much effort Jaleco put into the US localization of the game. Aside from the intro and ending, nearly all of Bashi's in-game text is surprisingly faithful to the Japanese version's. There were even a few attempts made to spice up the original script, which was otherwise fairly bland. The above screenshots demonstrate the added humor and melodrama found in Bashi's text, neither of which were at all present in Bio Senshi Dan. A few more noticeable changes are also apparent during gameplay in both versions. The US prototype has had its difficulty rebalanced, with earlier levels being more difficult than those in the Japanese version. 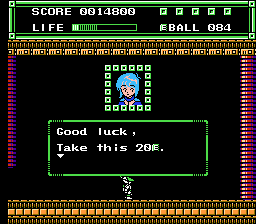 Enemies in Bashi Bazook are often faster and have more difficult attack patterns than in the original Bio Senshi Dan. 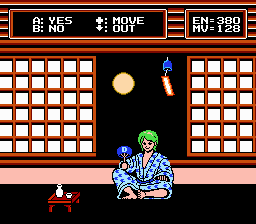 Aside from difficulty tweaks, a few graphical changes were also made to account for cultural differences; the scene in Dan's distinctly Japanese inn has been redrawn as something more generic, for example. More interesting is how a certain scene in level 4 is handled. In the US version, Bashi is transformed into a robot, while in Bio Senshi Dan, he is instead covered in makeup and turned into a large ogre-like creature. A lot of work was obviously put into Bashi Bazook. At the time, the game would have been Jaleco's most ambitious localization project yet, requiring more text translation and graphics modification than any of the company's previous games. For this reason alone, it's a shame that Bashi never saw release. 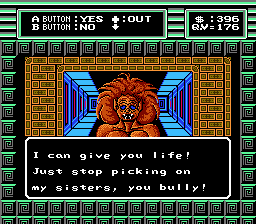 Considering Jaleco's current role as a lazy pusher of budget-priced shovelware, the game's cancellation is even more of a shame. Bashi Bazook symbolizes Jaleco's former willingness to put forth the effort in creating an original, quality product to drive sales, before the current state of the industry convinced them to do otherwise -- see the sidebar for some recent examples. So give Bashi a play-through, and shed a tear over Jaleco's fall from grace. Download Bashi Bazook: Morphoid Masher here. So what's Jaleco been up to lately? The answer may be sadder than you think. Unquestionably, the most idiotic video game to be released for any console ever. Bounce your car up and down to win. Then...uh, do it again. Then do it some more. And some more after that. Loading screens that depict flaming skeletons and the Virgin Mary complete the experience. A Dance Dance Revolution knockoff featuring stupidly easy gameplay and some of the most bizarre background videos your eyes will ever see. Want to see retarded children dance to the theme from Ghostbusters? You're in luck! Stepping Selection's sister game, Rock'n Megastage is a Beatmania clone that challenges players to hit one button in time to a vicious lineup of terrible J-Pop covers. Look out Konami, your Bemani series has competition! Jaleco proves that they can't even make a good racing game with this title, which touts the "feature" of your driver suffering a heart attack if he or she drives too fast. Let me repeat that - it's a racing game that punishes you for going fast. Not a game, but a product that turns any beer bottle into a tap through the use of nitrous oxide. Even this was a failure for Jaleco, who discontinued production of the item in June of 2005. Oh Jaleco, you can't do anything right.